So what do you select to watch next when your eyes have just been opened to the world of Telugu cinema by MAGADHEERA? I decided to stick with the Chiranjeevi extended family and, after seeing a few clips of Allu Arjun dancing on Youtube, picked Happy as my first foray into his films. Now if you’re like me and have watched a lot of song clips and then subsequently the film you will understand why I didn’t have high hopes for Happy. Allu Arjun looks great and is an amazing dancer, so I have to confess I was fairly sure that he wouldn’t be able to act – after all, no-one is perfect. Boy was I wrong! I think this first song was really commissioned by the Hyderabad tourist agency as it showcases the highlights of the city. It works for me and I would visit if they could assure me that I would get to see Bunny dancing at all the local sightseeing spots just like in this clip. Bunny’s nemesis is the quiet and dedicated medical student Madhu, played by Genelia in a much less shrill role than usual. This is the film where I realised that Genelia is a very good actress when she doesn’t have to jump around squealing excitedly. I really wish directors would use this quieter and yet much more expressive side to Genelia more. Madhu’s father is a caste leader with political ambitions and holds the view that as women have no place in the workforce, there is no need for his daughter to study. Faced with this opposition, Madhu keeps her head down and tries to be as inconspicuous as possible in the hope that her father will continue to ignore both her and her marriage arrangements until she has finished her degree. Bunny and Madhu clash from their very first meeting, and a series of misunderstandings makes sure that they each think the worst of each other. When Madhu’s father decides that her studying is bringing her into too much contact with others outside her caste, he arranges her marriage to DCP Arvind – Manoj Bajpay in a rather more comedic role than usual. In a dramatic meeting Madhu accuses Bunny of ruining her life, so he decides to try to prevent her marriage. Yes, it does all sound very familiar, but the twist here is that Arvind supports Bunny’s plan and the two erstwhile enemies end up married and sharing a flat together. Despite their marriage, Bunny and Madhu are still sworn enemies and they draw a line down the middle of the apartment to demarcate each other’s territory. They continue to harass and annoy each other and Bunny delights in stepping over the line both literally and figuratively to annoy Madhu. This part of the film will be very familiar to anyone who has a younger sibling as the pranks the two play on each other are very juvenile and reminded me of living with my brother. It is also extremely funny and the two actors are excellent at keeping the sparks flying without ever becoming too ridiculous. Over time the inevitable happens and Bunny falls in love with Madhu. In typical filmi–style devotion he will do absolutely anything for her except to tell her his feelings. 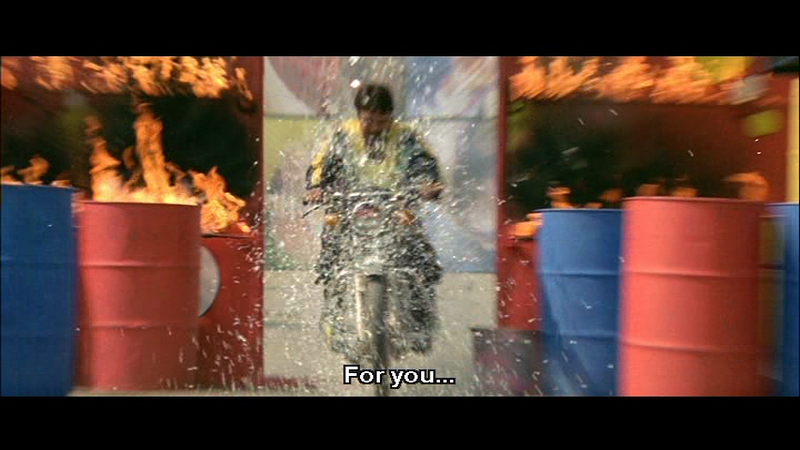 Due to his apparently amazing bike skills, Bunny gets a job as a stuntman in the movies and manages to juggle his pizza delivery with leaping over cars and through explosions in order to have money to pay for Madhu’s studies. He slowly acquires more bandages and bruises as the stunts get more and more dangerous although the bike seems to come through everything unscathed. Just when it looks as if the film is building up to a final romantic and ‘happy’ conclusion there is a real chance of pace. My theory is that the director Karunakaran realised that he has only a day left to film but plenty of money left in the fight and make-up budgets. So instead of the expected fluffiness, there is almost a full movie’s worth of drama, action and fisticuffs in the last few minutes of the film, along with buckets and buckets of blood. It was a little unexpected after all the comedy and romance of the preceding two and a half hours, but it certainly makes the end memorable. After watching a number of his interviews I am quite sure that a lot of this character is Bunny’s real extrovert persona. His performance seems totally natural and spontaneous throughout the film and he excels at conveying his character as much through his posture and mannerisms as through the dialogue and actions. I didn’t even find the coloured contact lenses as distracting as usual and, being an optometrist, contact lenses are often the first thing I notice. 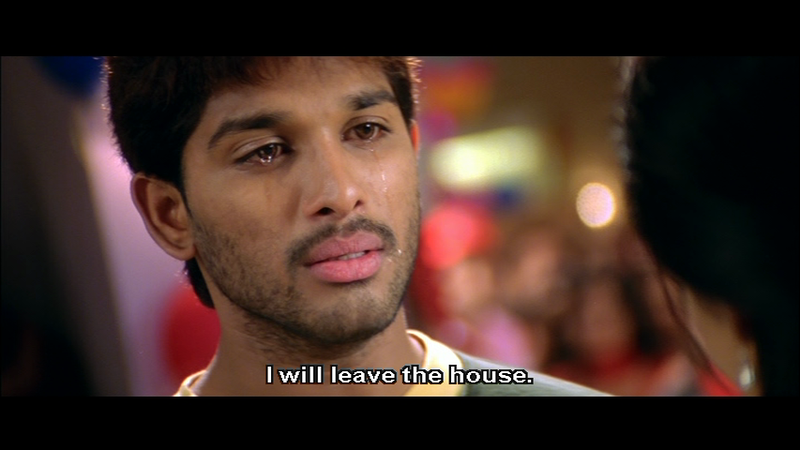 Despite the masking quality of coloured plastic, Allu Arjun can deliver every emotion using his eyes. It seems to be another family trait as the entire clan appear to have the most expressive eyes in the industry. The fight scenes are reasonably well choreographed, although they don’t have the slickness of Bunny’s more recent films. 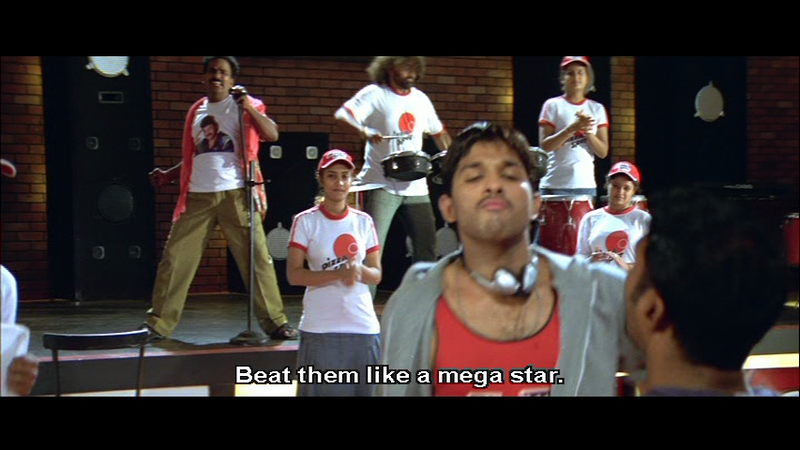 But where Allu Arjun really rules is on the dancing stage. He really is an amazing dancer and although there are only a couple of dance tracks in this film, he is totally mesmerising. The music by Yuvan Shankar Raja is catchy and overall works well for the young characters and the happy feel of the film. Genelia was a revelation to me in this. Previously I’d seen her in a couple of Hindi films and one other Telugu film, where she was generally hyperactive with piercing dialogue delivery. Here she has great chemistry with Allu Arjun in their scenes together and deliveres an excellent performance as the struggling student. She makes the most of her emotional family scenes and is believable as the daughter trying to live up to her father’s expectations while vowing to fulfil her mother’s dreams. Really a good decision by Karunakaran to allow her to be more subtle and showcase her acting talent in this way. Manoj Bajpay indulges in the most scenery chewing I have seen from him, but as always carries his role off with flair. The other support actors all do well enough and a couple of Bunny’s friends make an impression with their roles. Happy is still one of my favourite films and I re-watch it if I need a pick me up after a bad day. It has comedy, action, drama, great dancing and fantastic performances from the leads. It doesn’t try to be anything other than a masala entertainer and as such it works very well. It would be a five-star movie if it wasn’t for that ending which is just a bit too over the top and ridiculous, even for me. 4 ½ stars. This entry was posted in Tollywood and tagged Allu Arjun, Brahmi!, Genelia, Happy, Karunakaran, Manoj Bajpai, Venu Madhav, Yuvan Shankar Raja. Bookmark the permalink. Despite having seen a lot more films by many more actors now, I still keep coming back and rewatching films like Happy and every DVD order has a few more Chiru films! They’re a very addictive family! 😀 But there is so much good before the ridiculous ending! I’ve seen this so many times, I think I’m secretly starting to enjoy even that! I decided to stick with the songs that were my inspiration for watching the film, but Egire Mabbullona is fantastic. I do like the way one of the backing dancers is chased across the front of the stage by another dancer wielding a knife in Ossa Re – it’s just so random! And I can’t explain the charisma either. I put a lot of it down to the eyes, but he also sparkles with life and energy. I’m convinced every time he looks at the camera he’s having the time of his life and that enjoyment is part of it too. The Movie bombed at box office initially but it’s one of the most watched movie on TV and kids love it..My 5 year old nephew used to cry unless we let him watch this movie everyday. Of course no one likes the ending and we too stop watching it before jenny quarrels with bunny…!! But my nephew & his buddies watch it till the end every time..
It’s such a shame the end is so violent – the rest really does make me happy! I guess I’m just like a kid when it comes to movies, since I love this one – probably just because it is so silly! Apparently I watched this, and have almost no memory of the experience, except for the room-dividing part. (It reminded me of a book from my childhood, “This Room is Mine” http://www.amazon.com/This-Whitman-small-world-library/dp/B0006BPKA8). I think in my mind I’ve somehow merged the pizza delivery subplot from Happy with the pizza delivery subplot from Kanthaswamy, which makes it even more confusing. I’m looking forward to rewatching it, especially for Manoj Bajpai, even if it means I have to suffer through Genelia again. You didn’t remember the ending? Which I think is memorable only in it’s terribleness, but still stands for the sheer amount of blood and what the? fighting scenes! But this was also my first Bunny film so it is etched on my brain somewhat. I like your Kanthaswamy mix-up idea though. A secret lair in the pizza place could have worked! nice review.i really enjoy this film as much as i have enjoyed ur review.i think u have an ability of putting some unwanted spoilers,no offence intended.comin’ to the film,my only qualm about the film is it’s climax.i think this movie has the worst climax ever.the film is only an average flick at the boxoffice,largely attributed to its climax.the general consensus about the movie is that except the climax the movie is highly entertaining.nevertheless,filmmakers should keep in mind that climax is a very crucial part of the film n could not be taken lightly.i hope u also watch arya-2 which has a very unusual characterisation of arjun. Thanks for your comment. I totally agree that the ending is terrible, but sadly I have seen worse! Arya2 is my favourite Telugu film and we did actually review it a few months ago here. The hero in Tamil is Prasanna who’s an aspiring film director and a poor assistant director at the moment. And the story is more often than not, quite subdued. And Prakash Raj plays Manoj Bajpai’s role which is slightly meatier (or maybe Prakash Raj just does it so well) and has some hilarious interactions with the hero. The director later cleverly brings in the same scene in the climax where she emerges from the smoke due to a van spraying mosquito repellent ! Thanks for your comment 🙂 I realised I have a copy of Azhagiya Theeye but I haven’t watched it yet, and my DVD doesn’t have subtitles. I must move it up the pile and watch it soon! It does sound similar – I will get back to you once I’ve seen it!